Children will enthusiastically enjoy this creation preschool curriculum! Thirteen comprehensive curriculum lessons combine science, art, physical activities, Bible memorization, and songs, as well as activities for younger and older students. Children will explore light, darkness, water, land, plants, sun, moon, stars, sea creatures, birds, animals, and people with a wide variety of engaging, hands-on, cross-curriculum activities. 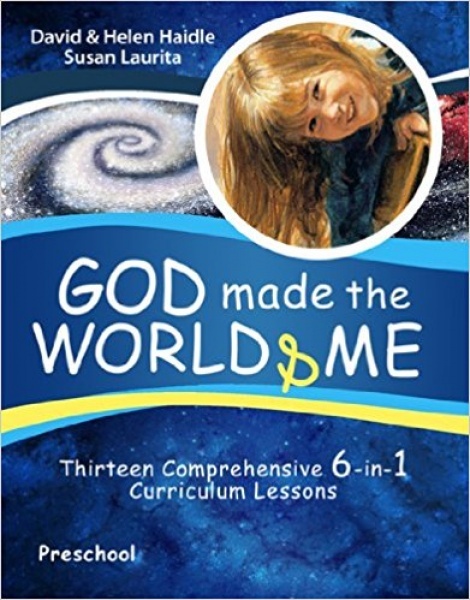 Developed by a professional with 30 years' experience in early childhood education, God Made the World and Me is a wonderful opportunity to start building a solid faith foundation while preschoolers learn about the world around them.